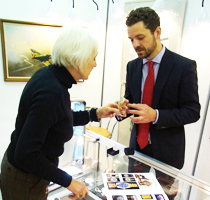 One of our specialists will appraise your item and advise you what it is worth in the current market. There is no charge for this service. You can contact us to make an appointment to visit our office, or come along to one of our free Kent auction valuation days. Alternatively you can email us images of your item with as much information as possible. If your goods are too large to bring in for valuation then we can arrange for a specialist to visit you. Based on the estimates we provide you can decide whether you would like to enter your item for auction. If you decide to go ahead then the item is consigned to Grand Auctions for cataloguing. Shortly before the auction we will write to you confirming the estimates for the item and what lot number it will appear as in our sale. The seller's contract provides details of your item's reserve price as well as what seller's fees you will pay. The reserve is the minimum amount for which your item can sell. It is confidential and is not disclosed to potential buyers. If your item fails to reach its reserve on the day of the sale then it will not sell and you will not be charged a penny. You are free to collect your item or try again in a future sale. If your item does sell, you will pay commission of 20% including VAT on the first £5,000 and 12.5% including VAT thereafter. The only other charge is a small insurance and limited liability charge of 1.75% + VAT on the hammer price. Our specialists are highly qualified and have many years of experience in their fields. This inspires confidence in our buyers. Every lot in every auction is marketed to our huge database of private buyers and dealers. Our catalogues appear on auction site www.the-saleroom.com which amalgamates hundreds of sales across the world. Buyers can bid live over the internet from anywhere in the world as if they were sitting in the saleroom. This exposes your item to literally thousands of potential buyers. Grand Auctions will send payment within 28 working days of the sale. In practice we tend to settle within a calendar month. For more detailed information, please read our Terms.